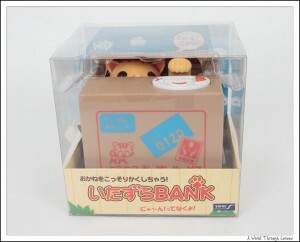 This is Itazura Bank (いたずらBANK) made by Shine. Itazura (いたずら or 悪戯 in Japanese) simply means mischief or prank, but I am going to call this Naughty Kitty Coin Bank in English. It’s been out for a while now, I think I first seen it just as the year 2010 arrives. Now as much as it looked interesting back then, I never got my hand on one. 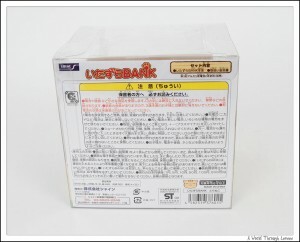 A few weeks ago Hobby Link Japan listed for a price of 1,530 JPY, which I think is pretty cheap, so I bought it. 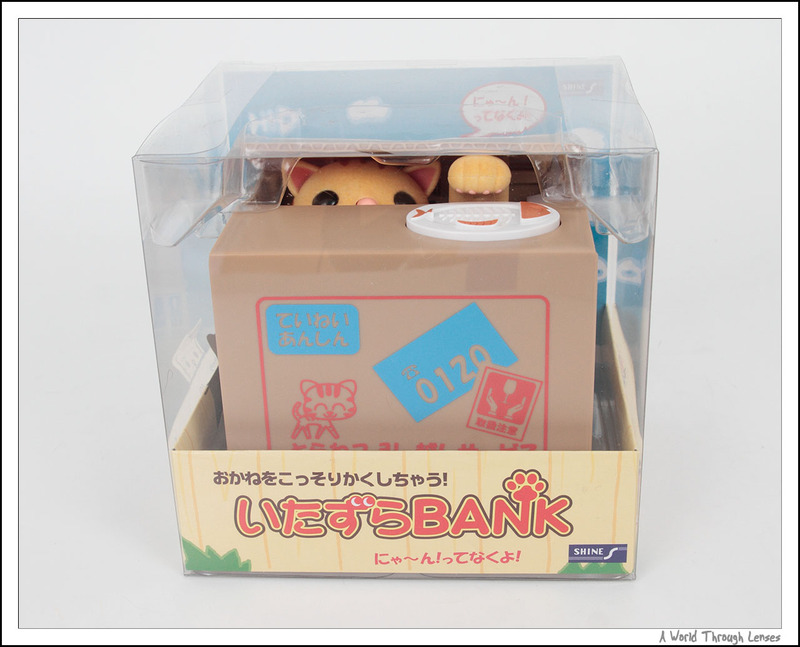 There are four different models of Naughty Kitty Coin Bank and there are four models of Naughty Puppy Coin Bank. Each model has a different box print and a different cat/dog. 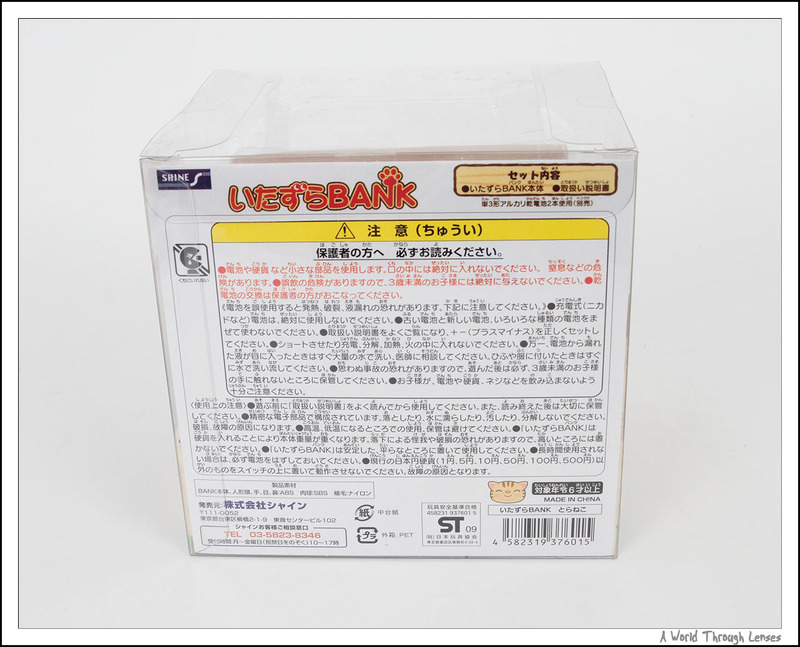 The item is since sold out from Hobby Link Japan. However, another trusted shop J-List still has it in stock for a slightly higher price of $28 USD. J-List ships some item from USA while some from Japan so those of you in North America might pay slightly cheaper shipping than directly from Japan. Well here we go. The coin bank came in a transparent box which allow you to see pretty much the entire coin bank clearly. The original Saber makes a return to show off her new weapon — “Ever-Distant Utopia” ~ Avalon and “The Promised Sword of Victory” ~ Excalibur. The sword/scabbard accessory set is also a Dolpa 24 limited item that I’ve obtained together with Dollfie Dream Saber Lily. However, it seems more fitting for the original dollfie dream Saber rather than Saber Lily to use it. It’s more than 2.5 years ago in April of 2008, when Volks released the original Fate/hollow ataraxia Dollfie Dream Saber. 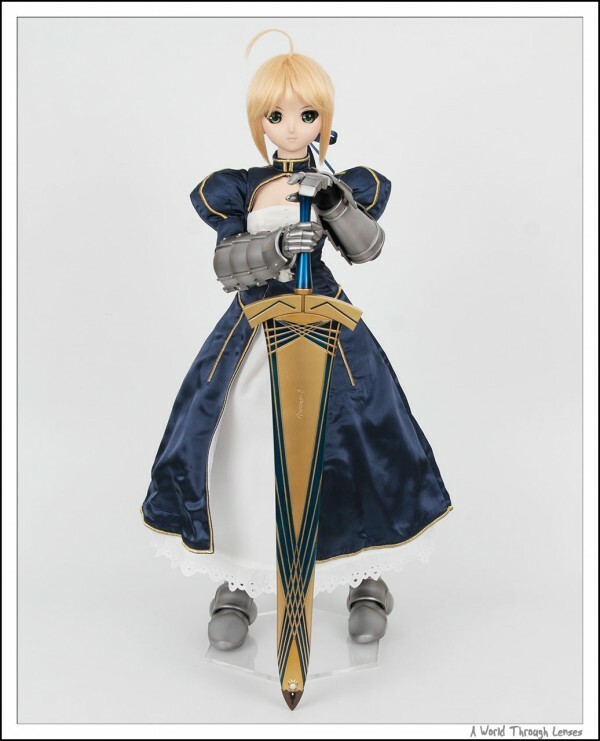 The a few months later in December of 2008, Volks released Saber Alter. Saber Alter is actually identical to Saber in terms of head sculpture. The wig is also nearly identical with a different coloured hair, a different coloured ribbon at the back and sans ahoge on top. So the only difference is Saber Alter is in white colour and has a different/much simpler outfit than Saber. Surprisingly thought, due to the popularity of Saber Alter, at times it actually fetches higher prices in auctions than original Saber. It really gave a new meaning to “less is more”. Now 2 years after Saber Alter’s release, in 2010, Volks released Fate/unlimited codes Dollfie Dream Saber Lily with a brand new yet even more complex outfit/armor set than the original Saber. It also sports a new head sculpture and a new new wig. Since I own both the original dollfie dream Saber and the new dollfie dream Saber Lily, I decide to do a side by side comparison so that the difference between the two can be examined in detail. Let’s start by comparing the head and the wigs. Despite the obvious difference in wigs, one thing to note is that the ahoge on Saber and Saber Lily points at different directions. So in the softer side of Saber Lily post, Saber traded her armor for a nice dress. But this time around, Saber takes off even more. Saber Lily has such impressive set of outfit that even the underwear under the dress is impressive. It came with garter styled socks, a corset, and even the underwear is impressive with laces and matching ribbons. 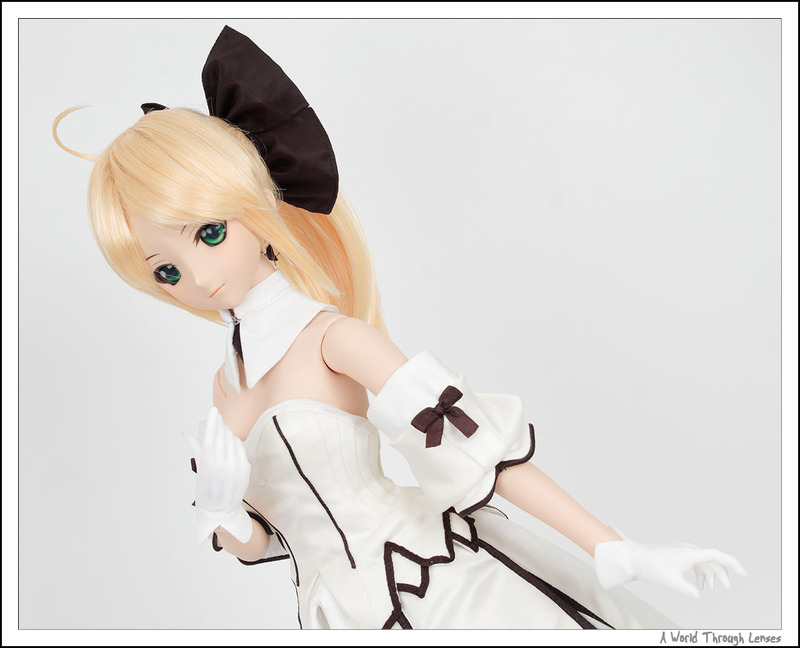 In the last Saber Lily unboxing post, Saber Lily was shown in full armor, fully combat ready. This time around, the armor is off and let’s show you the softer side of Saber Lily. Yes indeed, under that shinny knight’s armor, Saber Lily is wearing a beautiful white dress. Like any lady, the “white” Saber even have a set of white gloves. These gloves are not actual gloves that goes on the outside of the doll’s hand. Instead, they are hand part that looks like hand in white gloves that goes onto the arm just like all the other hand parts. Volks includes just two white glove hands for Saber Lily so it is not possible to pose her with any other hand gestures.